Registration is required. Maximum 25. Join us for a walking tour exploring several of downtown Winnipeg's Tyndall stone buildings. Tyndall stone is a fossil-rich limestone that formed 450 million years ago in a shallow sea near the equator. 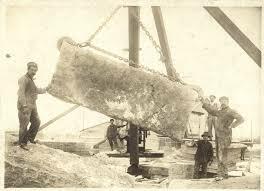 Quarries near Garson, Manitoba have been the only source processing the stone as building material for the last 120 years. Learn about Tyndall stone's geology, how to spot and identify fossils, and about the stone's use and relationship to people in the region over the last 3000 years. Meet in the Local History Room, 4th floor. Rain date: Sept. 28.